As America heads into another presidential election cycle (do they ever really end? 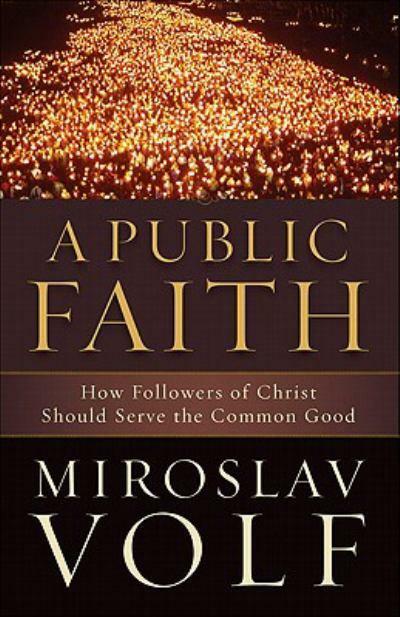 ), a new book by Yale theologian Miroslav Volf evaluates the proper role of religion, especially Christianity, in public life. In A Public Faith (Brazos 2011), Volf rejects both a coercive Christianity that would seek to dominate society and an idle Christianity that would retreat completely to a private space. He advocates a middle way for Christians in our religiously pluralistic culture, a “creative engagement” with the world. The publisher’s description follows. Debates rage today about the role of religions in public life. As the world becomes increasingly interconnected, various religions come to inhabit the same space. But how do they live together, especially when each wants to shape the public realm according to the dictates of its own sacred texts and traditions? How does the Christian faith relate in the religious pluralism of contemporary public life? While Volf argues that there is no single way Christian faith relates to culture as a whole, he explores major issues on the frontlines of faith today: 1) In what way does the Christian faith come to malfunction in the contemporary world, and how should we counter these malfunctions? 2) What should a Christian’s main concern be when it comes to living well in the world today? and 3) How should we go about realizing a vision for human flourishing in relation to other faiths and under the roof of a single state? Covering such timely issues as witness in a multifaith society and political engagement in a pluralistic world, this compelling book highlights things Christians can do to serve the common good.